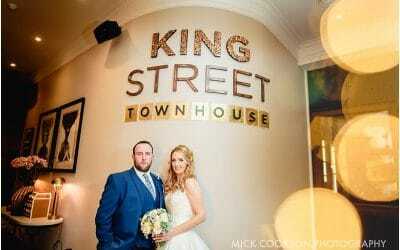 Joanna & Nick were married at Manchester Town Hall just before Christmas. I love shooting in the Town Hall, especially in Winter; I’m a low light specialist and love using high ISO, fast prime lenses and available light wherever I can. But even in winter, there are times when a little off-camera flash is called for, if only to ‘lighten the mood’ a little 😉 Joanna & Nick’s wedding was possibly the most relaxed affair I’ve ever witnessed. No ties, or matching suits. No fuss(y) formalities, minimum flowers, transport and an intimate gathering of family and friends made for a brilliantly relaxed wedding. And there was time to keep up to date with the footie scores….Nick’s a massive City fan (good lad!). Simon, his Best Man had flown in from Australia too, and was as chilled like he’d just got off the bus! But a 4pm ceremony in December…in the Town Hall means one thing. It’s going to be dark. And atmospheric. Perfect. For all you photographers out there, we’re talking 3200/6400 ISO and f1.4 lenses here, with the occasional radio triggered flash for the formals. 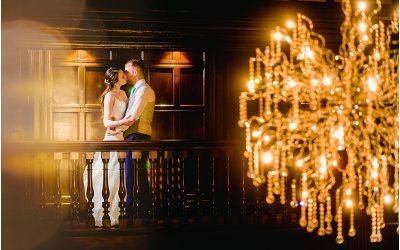 The Castlefield Rooms was a constant 6400 ISO…an almost candlelit bright environment. Joanna & Nick really like my ‘urban style’ of high ISO photography, and I had free reign to shoot as I pleased. This means travelling light with three or four lenses on a Nikon D3s. Still a brilliantly performing favourite amongst many wedding Pros. Opting for film emulation, the look of these images has been enhanced with a little grain…yes, added, to make the images look more organic and less digital, but not too much as to spoil the atmosphere of the images. With a quick stop off in the Christmas Market, it was off in a cab to The Castlefield Rooms. 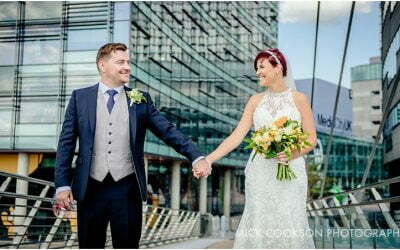 From being a ‘Manchester Town Hall Wedding Photographer’, it was time to become a ‘Castlefield Rooms Wedding Photographer‘ and settle down with a good old 50mm, 24mm and 35mm lens combination. No zooms here…just useless in the beautiful ambience offered by The Brindley Room. 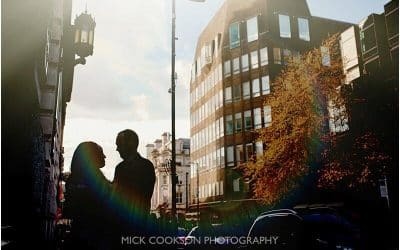 Overall, I’m very pleased with the look of Joanna & Nick’s wedding – very analogue and organic. Full of atmosphere and looking very different to the more ‘expected’ style. 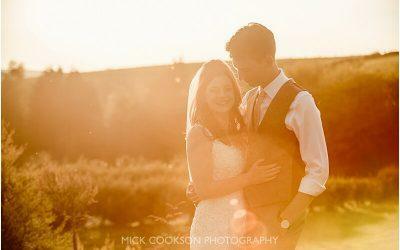 I’m certainly looking forward to more winter weddings in 2014…. 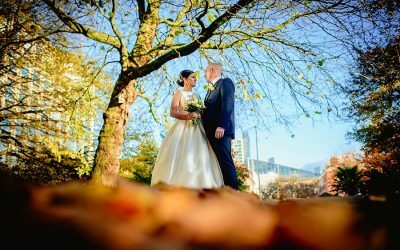 If you’d like to see more of my Castlefield Rooms and Manchester City Centre Wedding Portfolio, why not get in touch to view more work over a coffee?